Beauty Industry solutions for: Point of sale, Inventory, Scheduling, Sales reports, Employees, Marketing and More. Our key features consist of: Bar code support, Employee Time clock, Data backup and Standing (Recurring) Employee Scheduling. Like all of our software products, BeautyTrack Salon Software is completely user-friendly. With features like recurring or standing appointments, double booking, employee security, employee commissions, scheduling, E-Mail marketing, direct mail marketing, and inventory. BeautyTrack has everything you need to run your hair salon or day spa. BeautyTrack salon software was developed to allow the hair salon owner maximum control over the salon. 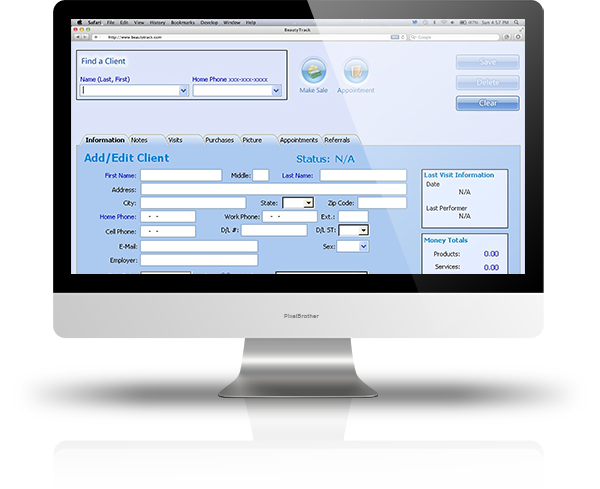 Our beauty salon software was designed to be completely user friendly and still provide all of the necessary functions you need to run your beauty salon or day spa. We even offer conversions of data from major beauty salon software competitors! Voted year after year as one of the top salon software programs on the market we have proven just how easy salon software can be. Request a demo of BeautyTrack and see for yourself! BeautyTrack salon software will truly improve the way you manage your salon. BeautyTrack is used all over the United States, Canada, and several countries in the UK! BeautyTrack beauty salon software even allows you to choose your OWN credit card processor rather than forcing you into an over priced processor like other salon software programs. BeautyTrack beauty salon software encrypts all credit card information using . This is the same encryption used by the US Federal Government. This is a requirement for PCI Compliance. I have been in the tanning industry for thirteen years (since I was 19). I am also a service tech and have been doing work in salons from Maine to Maryland and over to Pennsylvania. I have seen all the programs available and heard all the “horror stories”… I can honestly say that I have not heard anything negative about BeautyTrack. I have heard how easy the program is to use and how much others like it. I can say from my own experience that the program is the best I have worked with and tech support is just as good. BeautyTrack has helped our business in ways we never imagined. Our customers do not have to wait while we fumble through cards or try to calculate the last time they tanned. The system maintains all the information we need so that we can process payments, run customer reports, calculate sales and other business necessities so that we can focus most of our attention on what is most important – our customers. We used to close early on Sundays to do nothing but paperwork for 8 hours. Now we can do the reports nightly at 30 minutes each and we have sundays free in the off season and we extend our sunday hours for the peak season. The cost for the software and computer was paid for by one month of sundays (during the off season!). Not only is the customer, sales and employee information right there at your fingertips but so is the bed and maintenance information. Before, we would guess when we would need to change lamps, solution and filters. Now we can monitor and plan for the expensive purchase of new inventory months in advance. We saved a lot of money buying lamps & self tanning solution in the off season! By keeping a record of our customers, we are able to mail info directly to them so we can bring them in (through sales and promotions) when we need them. Now we decide when season begins and ends. Having a tanning salon without a program like BeautyTrack is like having a salon with nothing but 45 minute beds from the 80′s. Customers do not trust a tanning salon to maintain their beds and equipment if they are not savvy enough to even own a computer. With the costs of beds, equipment and the underlying costs of employee errors you can not afford to not have BeautyTrack. As a brand new salon we wanted to be sure our computer system was the best it could possibly be with solid protection against theft as well as easy to train on and operate. We reviewed several demos from all salon software companies and the price was not the only thing that caught our eye. BeautyTrack was by far the easiest to work with. The sales staff was so accommodating and helped us with all our questions and concerns, we were able to get all the accessories we needed and even after purchasing a one year technical support and updates membership we stayed well within our budget! Setting up BeautyTrack was SO SIMPLE and user friendly!!! I still can not say enough good things about the product and their staff!! Any time I have a question, my calls are handled quickly and they never make me feel stupid for not knowing how to do something!! When I find something in BeautyTrack that I feel would make things go smoother for me or the business, I let them know and on several occasions when I get my updates I find that they actually listened to my input !!! We are planning on opening additional salons and there is no question that BeautyTrack will be in every one of them!! Thanks BeautyTrack and Staff for making my salon run so smoothly!!! The BeautyTrack support department is absolutely ‘AWESOME’. Prior to my opening my salon I worked for a software company (we partnered with Microsoft) and I have had the opportunity to deal with many different organizations support teams that make up their partner channel. I rate your team at the very top of the scale as far as knowledge and responsiveness. Thank you!! From the first time I talked to Nichesoft, the positive, “can do” attitude has never failed. When I had problems getting a connection between computers, you walked me through, over an hour on the phone, the steps to make the computers talk. When I first started using BeautyTrack, I had about a million questions. Your patience in explaining each step and for answering the million questions was truly remarkable. Even now, when I call up and explain a problem or if I have a suggestion for an upgrade, you listen and even seem to understand what I am describing. You have always been professional in your handling of any issue I have presented. It has been my pleasure to be associated with you and to be able to promote BeautyTrack at every occurrence. We use the BeautyTrack program by Nichesoft in our salon and we love it!!! BeautyTrack is easy to access and very user-friendly. Training my employees is easier than ever. Not to mention how simple the record keeping is, the program does it all and that makes my life easier. The technical support team is always available and willing to help. I credit the smooth operation of my salon to this program. We couldn’t ask for anything more in our BeautyTrack software!!! BeautyTrack has been wonderful for our salon. We searched around for a few months on the best software for our salon, each of us loaded and played with each program and agreed unanimously that BeautyTrack was the easiest and most efficient to use. There are constant updates and the very few times we used technical support the service was above and beyond. We have had the program for two years now and are still very pleased with our purchase. You can’t go wrong with BeautyTrack!